From low-maintenance fiberglass to elegant stone, bathtubs are available in a wide range of materials and styles. The material of your tub determines its durability, cost, appearance and functionality. 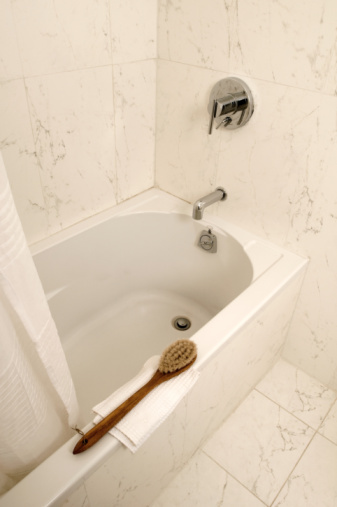 Identifying the material that your tub is made from is a critical first step before you begin a small project like cleaning or a large project like a bathroom remodel. Looks alone are usually not enough to identify your tub material, but a few tricks can help you narrow down the possibilities. Porcelain? Acrylic? A simple evaluation should help you determine your tub's material. Knock or press on the outside wall of the tub. 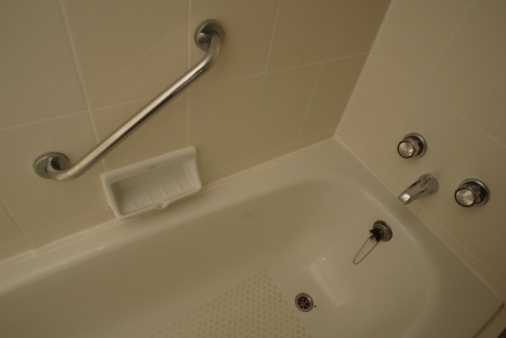 Some tub materials, like acrylic and fiberglass, are thin and flexible. If you knock on the side of the tub and the material has a little give, your tub is likely fiberglass or acrylic. A deeper sounding thud and no flexing suggests an enamel-coated steel tub. Evaluate the surface of the tub for scratches or chips. Fiberglass and acrylic tubs are the most prone to scratches, cracks and other surface damage. Chipping is likely to occur on a porcelain-coated tub if heavy objects are allowed to fall on it. Spots of fading along the bottom of the tub also suggest fiberglass. If chips reveal a material underneath the outer coating, look for signs of rust, an indicator that the material is likely porcelain-coated steel or cast iron. Examine the flooring around your tub. Cast iron tubs often require additional floor reinforcement to withstand the tubs' weight. Though this work is sometimes hidden in subflooring, some bathrooms are designed with frames to support a heavy tub. If you have access to the area beneath the tub from the floor below, examine the subfloor for additional joists or oriented strand board, either of which can support the extra weight of a cast iron tub. Hold a strong magnet to the outside of your tub. Both cast iron and steel tubs are magnetic; fiberglass, acrylic, cultured stone and wood tubs are not. If the magnet sticks, your tub is either steel or cast iron.